Successfully Added Multifunction Pop-Up Flash Digital Camera with Wide-Angle Lens to your Shopping Cart. High performance digital camera and camcorder combo with a pop-up flash and an included removable screw-mount 0.5x wide angle lens for taking stunning quality standard and wide angle photos. A high performance digital camera and camcorder with multiple function modes, the ZKX-DC5010-2GEN will provide you with a nice picture and video taking experience from the moment you take it out of the box. With this model you can take great quality still images of up to 12 Mega Pixels while also allowing you to take videos at a computer friendly 640x480 resolution with 30 FPS. This is the perfect camera for the beginner who is ready to step up their photo taking skills to the next level! Other notable features with the DC5010 digital camera include the LCD TFT display and traditional viewfinder for prime setting up your scenes, the performance pop-up flash for getting better pictures in lower light levels, a great selection of included accessories (carrying bag, cables, lens, travel charger, micro tripod), and of course the include wide-angle lens which allows you to take better macro shots and also enables you to get more into each photo (wonderful for large group pictures!). 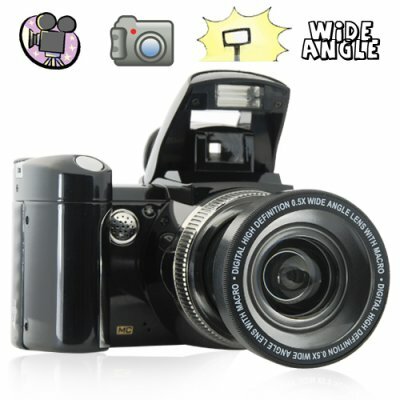 The low factory direct wholesale price and great set of features make this one digital camera that you should not miss. Buy one for yourself to see how good this baby really is. This model is in stock now for single piece or bulk orders, get yours today! Desktop style tripod mount included as a bonus to our customers! Is the product similar to the DC5010 wide angle camera you used to have on the website? Yes it is. This new 2nd generation model has a improved CMOS sensor and an updated firmware that includes additional languages. Can I order this camera in a different color? If you plan on ordering a large quantity then we may be able to help you. Please contact our customer service team if you require this service.